I first saw this book on Iliana's blog last year. She mentioned it briefly, and when I saw that it's set in Egypt, I immediately wanted to read it, too. Only my library didn't have a copy. And I wasn't sure I wanted to buy my own copy without knowing if it was any good. So, I asked my library to borrow it through inter-library loan....which sometimes works, and sometimes doesn't. Luckily for me, this time it worked. It just took a lot longer than I thought it would. (But then, considering it came to Utah all the way from Michigan, it's no wonder.) So instead of reading it last year like I planned, I ended up reading it last week. Was it worth all the hassle? Well... the mystery itself is actually pretty easy to figure out, so while this book reads fast, it's not super suspenseful. I did like the main character, just not enough to want to read about her again in another book. The side characters were a mixed bunch; I liked some, was annoyed by one in particular, and the rest hardly figured into the book at all. What I loved was getting to revisit all of Egypt's amazing tourist sites from Abu Simbel to Edfu. That was a lot of fun and ended up being my favorite part of the book. All in all, Death on Tour was a 3.5/5 star read for me. As long as they are newer titles, a lot of time my library will order books if I request them. Sorry this took so long but at least it was a decent read for you. The cover is awesome though. Gotta love that reaper! My library is picky about what they order, but they do agree to buy some of my requests. :) And hey, at least I got to read this one. I'd love to visit Egypt but the violence aimed at tourists would put me right off I'm afraid. Love this book cover! I actually felt really safe while I was in Egypt. The Egyptian people were very warm and welcoming and helpful. Some of the vendors even helped us find our way back to our boat when it unexpectedly changed docking places. They were super nice and made sure we were safe even though we didn't buy any of their wares. Sometimes the setting is the best part. I haven't read too many books set in Egypt. Love the cover! I do enjoy books set in Egypt...and any mystery with ancient artifacts. :) I wouldn't order this one, but I might pick it up at the library. The Egyptian setting was great. You could tell the author had been on a tour of those sites. But yeah, I'd check it out of the library and not buy it. I've had that author and her series (3 published - but none for quite a while) on my list for a long time. Janice Hamrick is a local author for Iliana and me - lives in Austin. I can't find where she's written anything since the last one in this series, but she did have a short story included in an anthology that I got last year. Thanks for the reminder, Lark. She writes a decent mystery. This one read really fast and was pretty enjoyable. Glad it was decent after the wait! My ILL comes from surrounding towns. It allows us access to more books but we still don't get a lot of them. I love the sound of the Egypt setting! And a murder mystery besides. Even though the characters were a little underwhelming it sounds like it's a decent read if my library has it- I'll check it out! 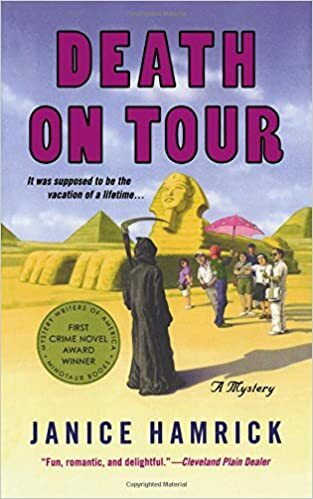 I need more mysteries set in Egypt! It is a good thing you could lend it at your library, and did not have to buy it yourself :-) Some books are fun and alright, but not a book you need to have on your own shelves. I'm intrigued by the setting although it sounds like an OK read to me. I'll have to see if our library has a copy. It's definitely a good library read.